I thought something like this would be terrific in my designer house room, and that I’d like to try making a Victorian Curiosity of my own featuring natural elements. Hello everyone. Thanks for stopping by my blog again! Today I thought I’d share with you a project I’ve been working on for my Bucks County Designer House Sunroom: A Garden Cloche. Lately I’ve been seeing a lot of glass domes and cloches around: in various magazines and shops I’ve visited. I just love them! I especially like them with a Victorian feel of curiosities under glass. 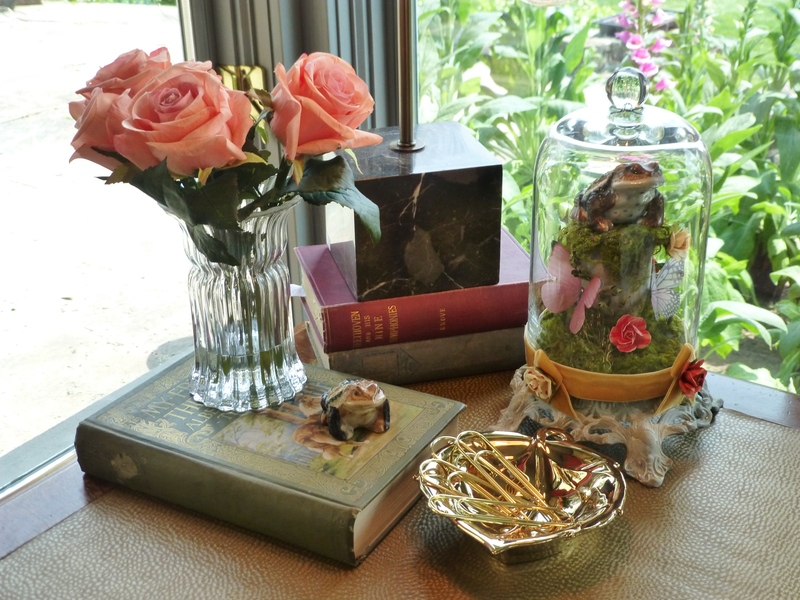 A beautiful antique Cloche featuring natural elements and a Butterfly. I created a great Pinterest board with great ideas for various items to place under glass domes. Of course it occurred to me that something like this would be terrific in my designer house room, and that I’d like to try making a Victorian Curiosity of my own featuring natural elements. Then one day I saw a couple of inexpensive glass domes at Michael’s craft supply store. I snapped them up for under $10 each and started brainstorming about how I could use them, and what I might feature underneath. 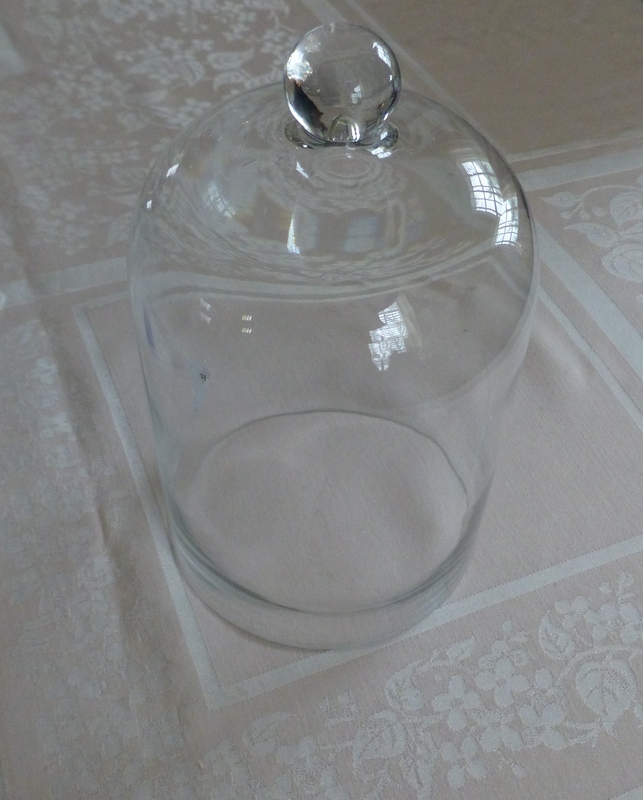 One of two clear glass domes, or cloches, that I bought at Michael’s craft supply store. I’ve had these wonderful pottery toads in my collection for some time, and I love how textural and warty they are. The toads have such great color and an earthiness about them, I knew they’d be terrific under glass with some moss and greenery. But my toads are pretty short and stocky, while the glass dome is tall. So I knew I needed to elevate them. Then I remembered I have several chopped off pieces of 2 1/4″ diameter wood poles from drapery hardware installations. I had the bright idea of using them for risers inside the domes, on which I could mount the toads. I also decided purchasing round wooden discs from the craft supply store would be an easy way to create a base for the cloches to rest upon. 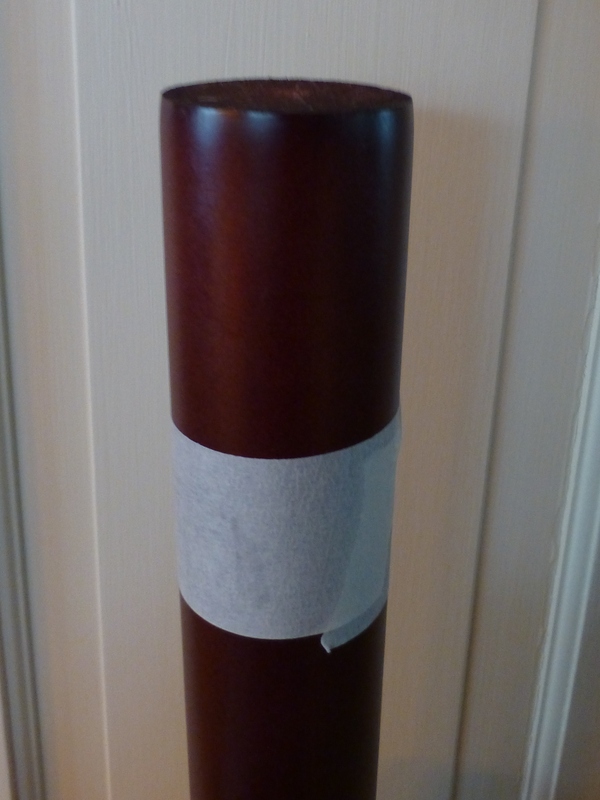 This wood drapery rod will make a perfect post for mounting my toad under glass! An unfinished lamp base and inexpensive wood discs from the craft supply store will look great under my glass domes. I’ll give them a custom paint job using Milk Paint. Once I’d made some of these decisions, I decided the wood on the bases and pedestals needed a finish. I’ve been having a lot of fun with Milk Paint recently. 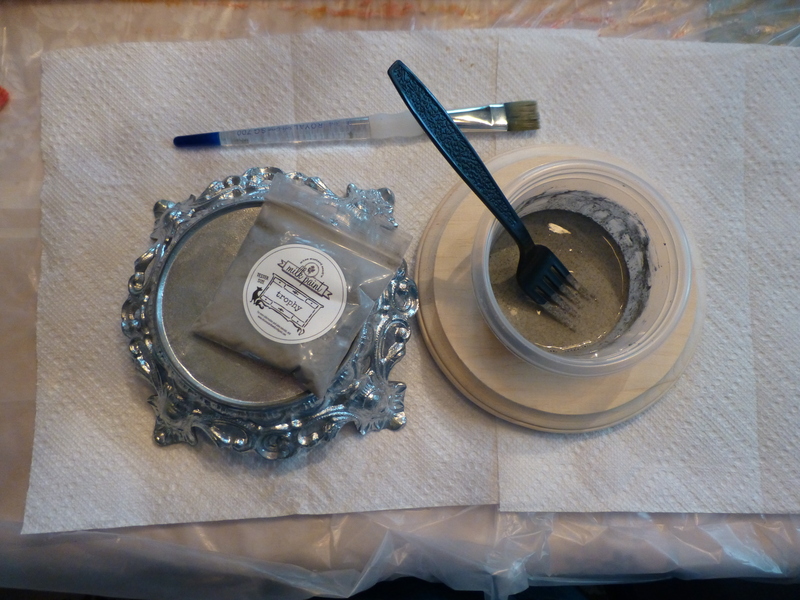 I love the Miss Mustard Seed blog and have been trying out some of her Milk Paint products. 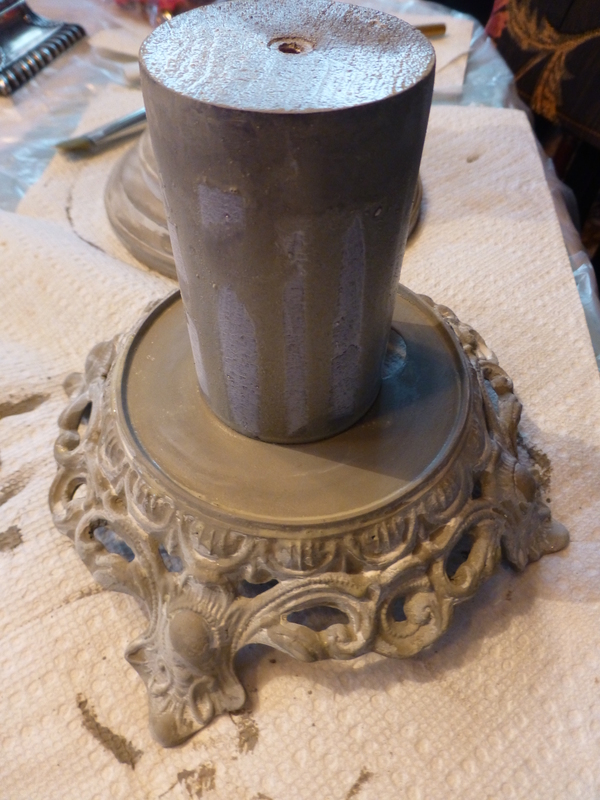 http://www.missmustardseedsmilkpaint.com/ I used two colors (Trophy and Ironstone) to achieve the finish on the pedestals…I created a wonderful chalky, weathered-stone look. I’m so happy with the earthy finish I was able to achieve! Using two colors of Milk Paint, I was able to achieve a chalky, weathered stone appearance on my cloche bases and the posts. 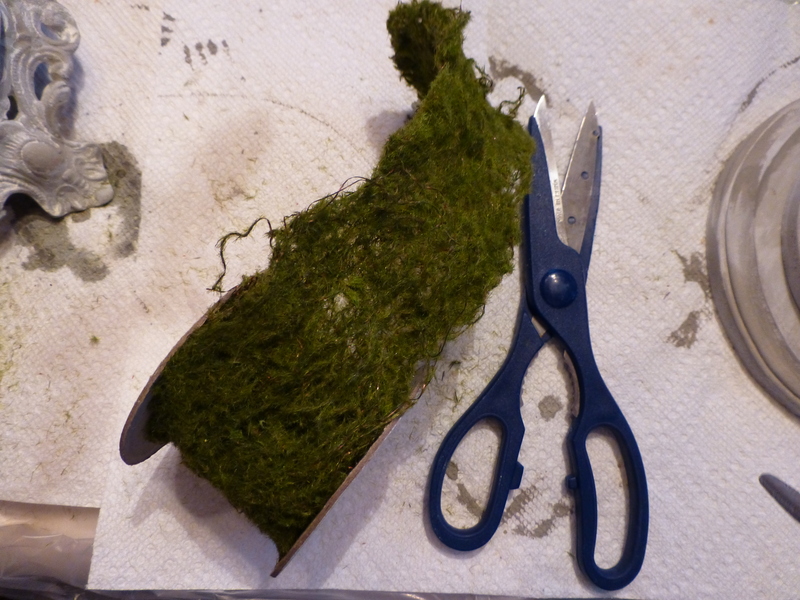 Next, I found some really cool moss ribbon at the craft supply store and I adhered it to the post, using hot-glue. This created a wonderful natural-green look. 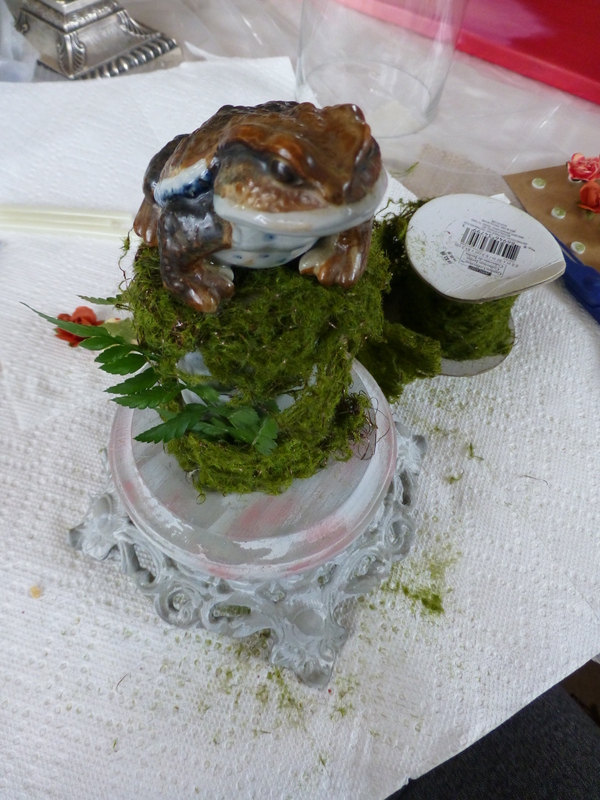 Once I had the base embellished with the moss, I mounted my toad figurine on top of the post. I had to be careful of the toad’s positioning before applying the glue–remember, the glass dome must comfortably fit around the objects. Moss ribbon will be used around the post. The toad gets glued onto the top of the moss-covered post, which is mounted to the wood base. 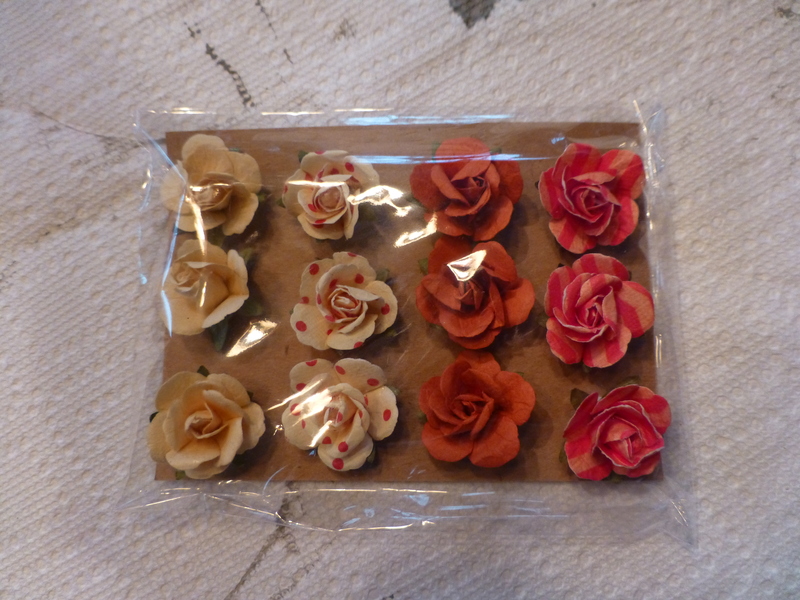 I picked up some cute paper flowers while I was at Michael’s and ordered wonderful vellum butterflies on Etsy…they are made of translucent paper which makes them look SO realistic! I artfully applied the flowers and butterflies in various places around the post. 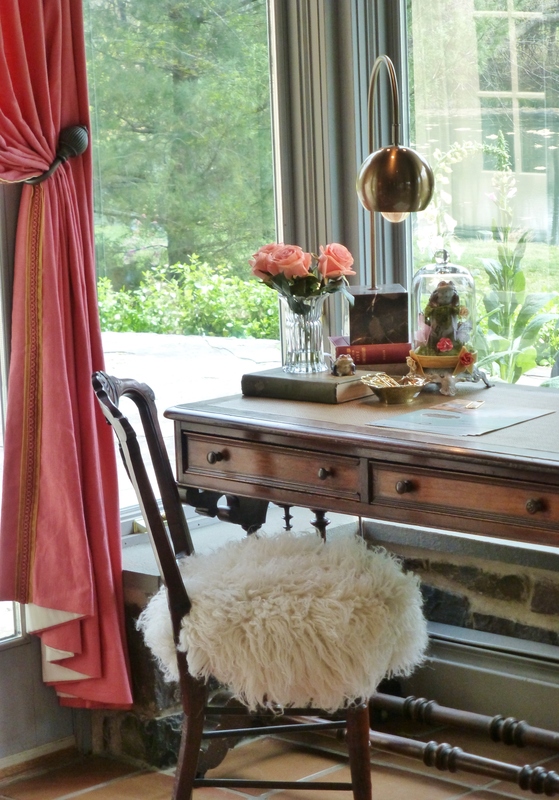 A packet of paper flowers in my Bucks County Designer House Sunroom colors. Finally, I washed my glass dome, adhered it to my wonderful weathered-looking bases, and applied some gorgeous velvet ribbon to the base. A detail of the finished toad under glass, used in my Bucks County Designer House sunroom. I just love the quirky Victorian feel he has! I’m really happy with how this turned out! I think it has an exotic, vintage look to it, and is the perfect decorative accessory to use in my ‘Sunroom with Vintage Vavoom’ for the Bucks County Designer House. A detail of the Victorian Desk and Chair, with the Cloche sitting in the corner. Wouldn’t it be lovely to sit here, looking out at the grounds? Thanks for stopping by today! I hope I inspired you to create your own Victorian Curiosity Cloche–I think they’re really neat! 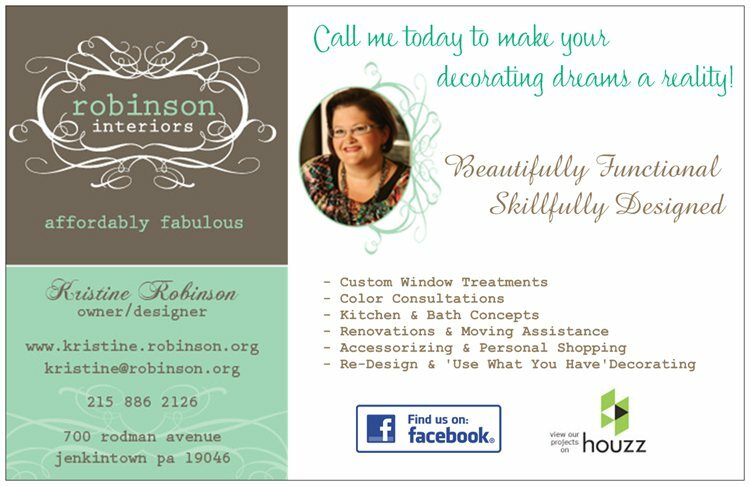 This entry was posted in Craft, Decor, DIY, Home, Interior Design, Tutorial and tagged Bell Jar, Bucks County Designer House, Cloche, Curiosities, Decorating, Interior Decorating, Nature, Sunroom, Victorian. Bookmark the permalink. Okay Kristine!!!! this is waaaaaay pretty! It looks classy and expensive, well done! I really like the desk lamp, where did you pick that up? Super talented you are!